Find out how these e-commerce giants stack up. E-commerce has taken the world by storm, and across the globe, you'll find various companies that have fought hard to take command of their local markets. MercadoLibre (NASDAQ:MELI) has become the dominant player in the Latin American region with its marketplace, and related services make the company a formidable force in the industry. Meanwhile, Amazon.com (NASDAQ:AMZN) has built up commanding success in the U.S. and has sought to extend its reach internationally as well. After years of strong gains, stock markets have turned choppy, and MercadoLibre and Amazon have both seen some big swings in both directions recently. Below, we'll look more closely at the two e-commerce giants to see which one seems like a smarter bet for those who want to add exposure to the sector in their portfolios. 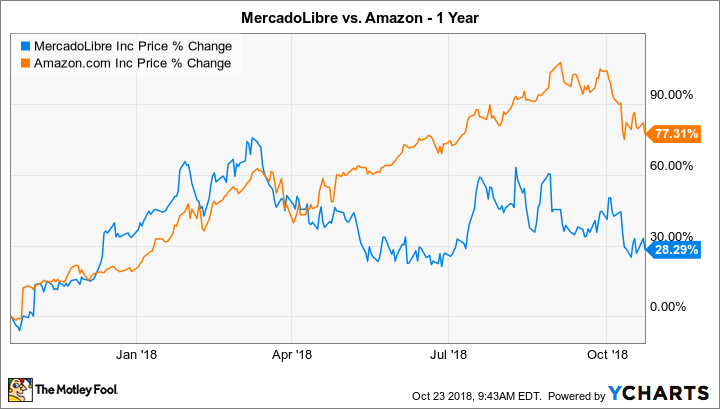 Both MercadoLibre and Amazon have done quite well over the past year, but Amazon's performance has been simply amazing. The U.S. company is up 77% since October 2017, compared with a solid but clearly less impressive 28% rise for its Latin American counterpart. Trying to look at valuation for either of these stocks is a challenge, because both of them have emphasized revenue growth over earnings. By investing heavily back into their own businesses, MercadoLibre and Amazon sacrifice near-term income for the prospects of a bigger payoff down the road. With traditional price-to-earnings ratios in the triple digits, neither one stands out from the other as a relative bargain. Some investors look at price-to-sales as a relevant valuation metric, and there, Amazon has an edge. It trades at just four times revenue, compared with about nine times revenue for MercadoLibre. Yet with a market cap that's just 1.5% of Amazon's, MercadoLibre makes a reasonable argument that it's the better play for those seeking future share-price gains. All in all, it's hard to pick a winner based on valuation. It'd be reasonable to assume that in the fast-growing e-commerce business, opportunities to reinvest capital into their businesses would have kept Amazon and MercadoLibre from ever having paid dividends to their shareholders. That's indeed the case for Amazon, which has always preferred to look for ways to expand its existing businesses or look at new offerings. For instance, not paying dividends made it a lot easier for Amazon to purchase Whole Foods Market for $13.7 billion, making an entry into the grocery industry and giving itself ready-made distribution centers for the rest of its businesses. Historically, though, MercadoLibre did pay a dividend. Amounts were typically modest, but they did signal a commitment to return capital to shareholders. That changed earlier this year, when MercadoLibre decided to suspend its dividend. Between the need to reinvest in many of the company's fast-growing businesses and challenges in some of its home markets, MercadoLibre chose to stop paying the $0.60 per share it was giving shareholders annually. Given that the payment represented just a 0.2% yield anyway, it's hard to say that many investors really missed it. The move also made MercadoLibre and Amazon equal in terms of dividends. Both MercadoLibre and Amazon have seen impressive growth and have the ability to keep moving forward in the future. MercadoLibre's most recent quarter featured 18% sales growth, led largely by a 36% rise in gross billings. Currency movements, which have run rampant in certain parts of Latin America recently, played a key role in holding sales growth back, but gross merchandise volumes and numbers of listings on MercadoLibre's marketplace rose substantially. Also, affiliated services did well, with the MercadoPago payment system posting 40% gains in payment volume and a 64% rise in transaction counts, while MercadoEnvios handled almost 60% more shipments than it did the previous year. With strong penetration on mobile devices and intriguing innovations, MercadoLibre is showing it can grow along with the Latin American economy. Amazon's growth is in a different category, in large part because its business is evolving much more rapidly. Despite having most of its consumer visibility in e-commerce, Amazon has moved into a host of different businesses, ranging from its Web Services cloud computing platform to its Amazon Prime Video streaming entertainment service. So far, Amazon hasn't made many attempts to maximize its current profitability, which is a key reason that its bottom line isn't representative of its true financial power. Yet its already massive size makes it increasingly difficult for Amazon to sustain the revenue growth that investors have gotten used to, and that might come as a shock to some shareholders despite its inevitability. In the end, although Amazon has plenty of opportunities for absolute growth, MercadoLibre's potential on a percentage basis looks stronger, and the Latin American giant has a lot further to run. Both MercadoLibre and Amazon fare well on these tests, but MercadoLibre looks like the better pick for investors. With a long runway ahead of it, MercadoLibre's growth trajectory should be able to stay steeper for longer than Amazon's.